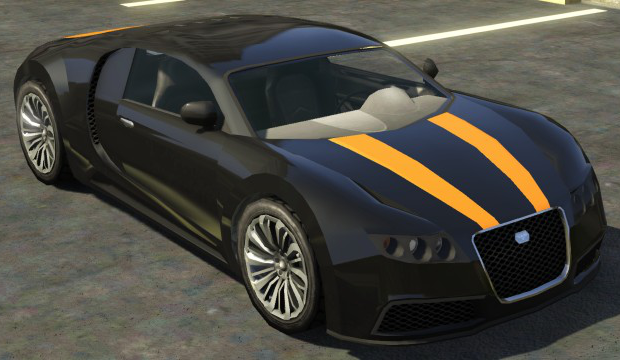 The Truffade Adder is a 2-door hypercar featured in GTA 5. 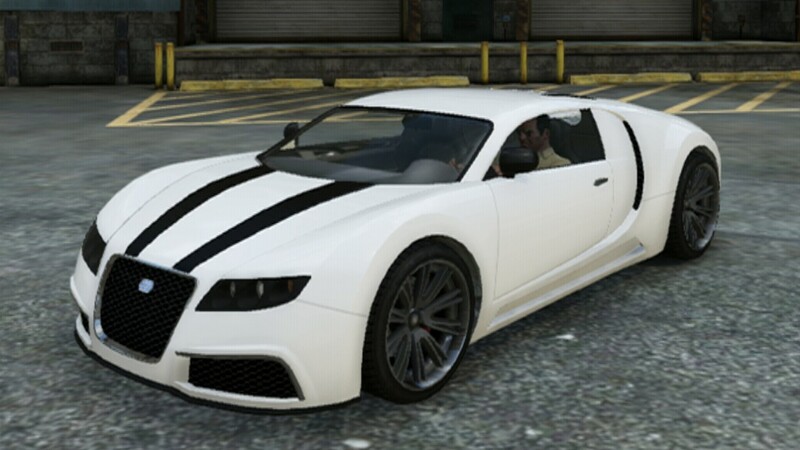 The Adder is heavily based on the Bugatti Veyron 16.4 Super Sport for the general shape, the greenhouse area, rear bumper area, and side windows. The design of this car has some resemblance to the Saab Aero-X for the wheels, headlamps, and front fascia. The taillights are based off Aston Martins, as they have sideways U shaped taillights. Some elements of the front and sides of the car appear to be inspired by speculated Super Veyron illustrations. If you’re looking for the fastest car available in Grand Theft Auto 5, look no further. The Truffade Adder can be purchased using your in-game mobile phone. Open your browser and navigate to www.legendarymotorsport.net, where this magnificent machine can be purchased for a cool $1,000,000. Spawns frequently in front of Sessanta Nove at Portola Drive, Rockford Hills as a reference to the Bugatti Veyron Grand Sport Bijan Pakzad Edition. Can occasionally be found parked in front of a house in Vinewood Hills. While you cannot steal Devin Weston’s Adder from his house after Blitz Play (the ‘enter vehicle’ button, Y or triangle, doesn’t do anything when pressed) and the gate will not open anyway), it is possible to steal it at the beginning of I Fought The Law..When driving up to the D symbol at the construction site, stop and get out on the footpath before the terrain changes to dirt (any closer and you will trigger the mission). You can see the Adder, Devin, Molly and another car clearly from there. Throw a grenade or fire an RPG at the other car, aiming to the left. If done right, the explosion will destroy that car, kill Devin and Molly, but leave the Adder relatively undamaged, and free for you to take. You’ll most likely gain a two-star wanted rating in the process. If you switch to Franklin, he might get a scenario where he is stuck in traffic in Downtown Vinewood with a black and silver Adder next to his car however this is a quite rare scenario.